Piss off, dancing Shetland pony and Mr. Wolfdog. This is the Year of the Goat in advertising. 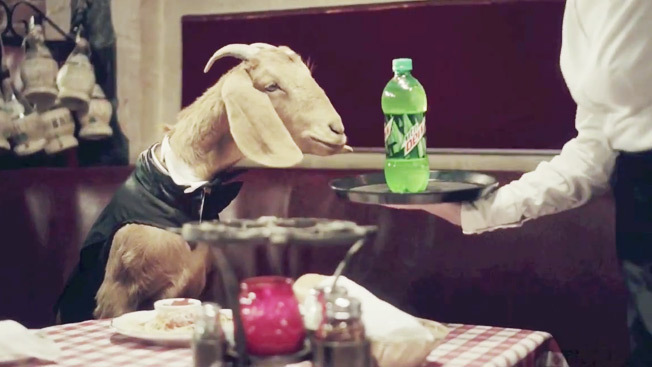 Tyler, The Creator, the leader of hip-hop collective Odd Future, directs and provides the raspy voice of Felicia the Goat in this 30-second slice of crazed commercial perfection for Mountain Dew. A waitress brings Felicia a bottle of the beverage, which the beast rejects, and hooves start flying as the server screams in terror, "Ooh, you're a nasty goat!" (I usually go hyper and pummel the waitstaff after drinking the stuff.) Felicia ultimately imbibes, trips out, demands more, and the comic attack intensifies. We're told the story will continue, which is great, because this insanity fits the brand's quirky personality. I can't wait for the sequel. Maybe they'll serve Felicia soda in a can and let her chew the scenery in a whole new way. Via Co.Create.